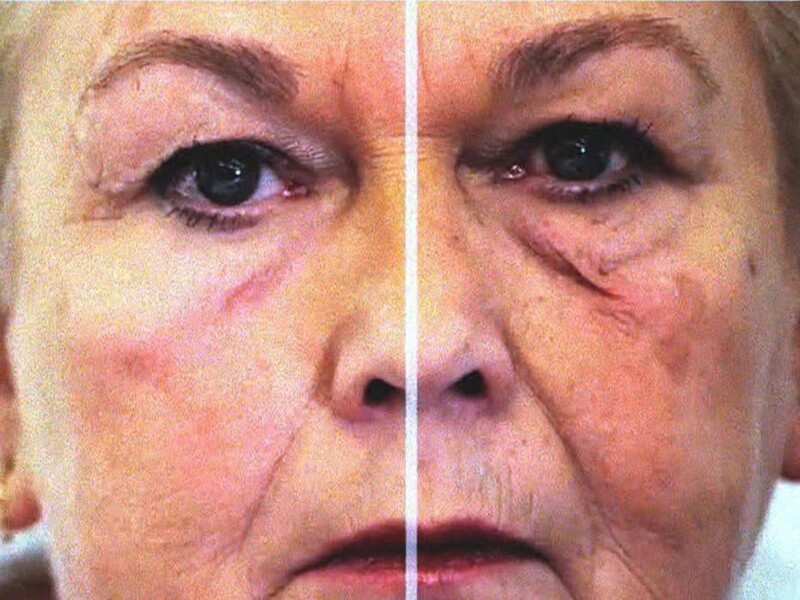 An incredible new “face lift in a tube” could dramatically reshape the appearance of eye bags and wrinkles without surgery, Gizmodo reports. Developed by scientists at the Massachusetts Institute of Technology, Massachusetts General Hospital, Living Proof, and Olivo Labs, the second-skin-like material comprises a network of cross-linked polymers that mimics the appearance, strength, and elasticity of healthy epidermis. But bolstering sagging jowls isn’t the only thing the wearable film, dubbed XPL, is good for. With further development, researchers say that it can deliver drugs to help treat skin conditions such as eczema, psoriasis, and dermatitis. A mere 70 thousandth of a millimeter thick, the material is applied onto skin using a two-step process, both in the form of a cream or ointment. The first layer consists of polysiloxane components. The second is a platinum catalyst that forces the polymers to bond to the skin, applying a “steady compressive force” that tightens skin for up to 24 hours. Upon application, the XPL “becomes essentially invisible,” according to Daniel Anderson, an associate professor of chemical engineering who helped develop the product. It also resists regular wear, he added. In tests, the XPL bounced back to its original state after being stretched more than 250 percent, compared with the 180 percent for natural skin. It also performed better in elasticity tests against silicone gel sheets and polyurethane films—two other types of wound dressing currently on the market. When examining the material’s ability to retain water in dry skin, researchers found that skin treated with XPL experienced less water loss than skin treated with a high-end commercial moisturizer. None of the study’s participants, they added, complained of any irritation from the XPL. Whether you’ll be able to pick up a jar of XPL at your local drug store still remains to be seen. Olivio Labs, which is working to bring the film to market, says it will focus on medical applications of the technology first. An incredible new "face lift in a tube" could dramatically reshape the appearance of eye bags and wrinkles without surgery, Gizmodo reports. Developed by scientists at the Massachusetts Institute of Technology, Massachusetts General Hospital, Living Proof, and Olivo Labs, the second-skin-like material comprises a network of cross-linked polymers that mimics the appearance, strength, and elasticity of healthy epidermis. But bolstering sagging jowls isn't the only thing the wearable film, dubbed XPL, is good for. With further development, researchers say that it can deliver drugs to help treat skin conditions such as eczema, psoriasis, and dermatitis.